The higher fruits of civilization can not be extemporized, neither can they be developed normally, in the brief space of thirty years. It requires the long and painful growth of generations. Yet all through the darkest pe¬riod of the colored women's oppression in this country her yet unwritten history is full of heroic struggle, a struggle against fearful and overwhelming odds, that often ended in a horrible death, to maintain and protect that which woman holds dearer than life. The painful, patient, and silent toil of mothers to gain a free simple title to the bodies of their daughters, the de¬spairing fight, as of an entrapped tigress, to keep hallowed their own persons, would furnish material for epics. That more went down under the flood than stemmed the current is not extraordinary. The majority of our women are not heroines but I do not know that a majority of any race of women are heroines. It is enough for me to know that while in the eyes of the highest tribunal in America she was deemed no more than a chattel, an irresponsible thing, a dull block, to be drawn hither or thither at the volition of an owner, the Afro American woman maintained ideals of womanhood unshamed by any ever conceived. Resting or fermenting in untutored minds, such ideals could not claim a hearing at the bar of the nation. The white woman could least plead for her own emancipation; the black woman, doubly enslaved, could but suffer and struggle and be silent. I speak for the colored women of the South, because it is there that the millions of blacks in this country have watered the soil with blood and tears, and it is there too that the colored woman of America has made her characteristic history, and there her destiny evolving. You can read the rest of Anna Julia Cooper's speech here. 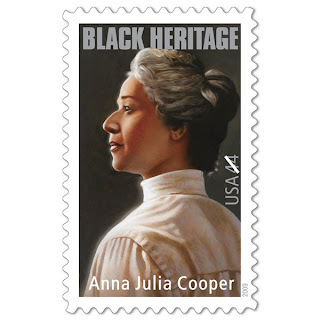 Cooper died in 1964 during the height of the Civil Rights movement and at the incredible age of 105! She's a total inspiration.